Oil spills—ranging from just a few gallons to millions of barrels—occur in the U.S. all too often. In fact, NOAA responds to up to 150 oil spills nationwide each year. The Deepwater Horizon oil spill in the Gulf of Mexico is a recent example of the extensive environmental and economic impact an oil spill can cause. It also demonstrates how important a healthy environment is for a sound economy. NOAA's Office of Response and Restoration (OR&R) leads environmental response, assessment, and restoration following oil spills in our nation’s coastal waters. For more than 25 years, we have worked cooperatively with other trustees and polluters to assess injuries to natural resources and restore habitats following oil spills. When we restore natural resources we are also investing in communities, by creating construction jobs for local economies and providing better opportunities for residents and visitors to access and enjoy the coastal and marine environment. 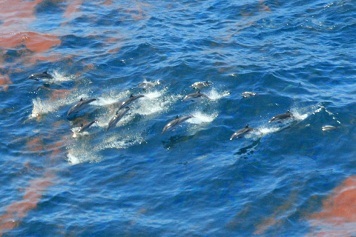 Striped dolphins (Stenella coeruleoalba) observed in emulsified oil from the Deepwater Horizion/BP oil spill. What is a Natural Resource Damage Assessment? The Oil Pollution Act of 1990 provides for a Natural Resource Damage Assessment (NRDA) to determine the type and amount of restoration needed to compensate the public for the environmental impacts of oil spills. NOAA developed the Damage Assessment, Remediation, and Restoration Program (DARRP) to carry out the NRDA process. OR&R is a central component of DARRP. We hold polluters financially accountable for the cost of assessing and restoring the environment. Please visit the DARRP website for information related to NRDA for specific oil spills. How Does NOAA Conduct a Natural Resource Damage Assessment? Determine what parts of the coastal and marine environment were injured. Collect data to assess threats and injuries to natural resources. Develop a restoration plan to compensate for environmental impacts and associated public losses. After the Chalk Point oil spill in Maryland in 2000, scientist samples sediment to determine the impact on bottom-dwelling creatures. What Happens When the Natural Resource Damage Assessment is Completed? Restoring and creating wetland habitats. Creating oyster reefs and other shellfish habitat. Restoring coral reefs and seagrass beds. Acquiring, restoring, and protecting waterfowl habitat. Removing barriers from rivers to allow fish to reach upstream habitat. Constructing boat ramps, fishing piers, and trails to improve recreational access.